How many cards can I hold? Normally, I'd have 7, but card text trumps rules. It depends, whichever one entered the battlefield last is the one that takes effect. When a permanent enters the battlefield it receives a timestamp. Then when determining the result of continuous effects (the kind generated by both Kruphix and Null Profusion) you apply them in timestamp order. So if the Profusion entered last you will have a max hand size of 2, and if Kruphix entered last you won't have a maximum hand size. If they were to enter the battlefield at the same time then the Active Player (the player whose turn it currently is) decides what the order of the timestamps is. 613.10. Some continuous effects affect game rules rather than objects. For example, effects may modify a player’s maximum hand size, or say that a creature must attack this turn if able. These effects are applied after all other continuous effects have been applied. Continuous effects that affect the costs of spells or abilities are applied according to the order specified in rule 601.2f. All other such effects are applied in timestamp order. See also the rules for timestamp order and dependency (rules 613.6 and 613.7). It depends on what order they entered the battlefield. Rule 613.10 says that we apply game rule-changing effects in timestamp order. Rule 613.6 explains how timestamps work. Whichever entered the battlefield later has the later timestamp, which applies second and overrides the earlier effect. Technically, there are ways to "refresh" the timestamp of a permanent, so the order they entered the battlefield is not always the same as their timestamp order, but none of those ways applies in the situation as described. How do split cards work? How do Phenomenon cards work in the Eternities Map variant? 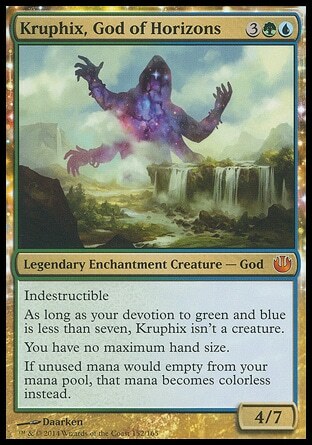 Prophet of Kruphix: Can I flash Bestow? Do abilities interrupt transform effects? 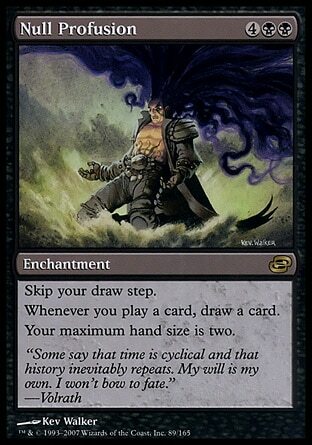 How can I find all cards with flavor text from a certain set and colour?